Photograph of the upper portion of the Bhagavati Temple with the Aanakuttil or elephant porch at Tiruvalathur in the Palakkad district of Kerala, taken by a photographer of the Archaeological Survey of India on the 1st February 1901. In the second volume of his work 'Malabar' of 1887, William Logan wrote about this temple, "Tiruvalathur - In Tiruvalathur amasam. Dedicated to Durgha. The Srikovil is covered with copper sheeting. the other buildings are tiled. 366 x 330 in extent." In Kerala temple architecture, Sree Kovil is the term used for the main sanctum of the temple. 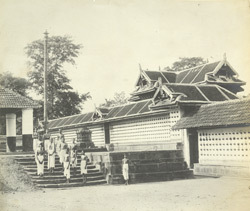 The photograph shows priests posed on the steps of the Bhagavati temple complex, with a tall dhvajastambham or flagpole to the left. The characteristic sloping roofs of Kerala temples, which became part of the building style as a protective device to ward off monsoon rains, were usually tiled, thatched, or given copper sheets. Kerala and Tamil Nadu were in close contact politically and culturally and traditionally Palakkad was considered the Gateway to Kerala, because the natural gap in the hills of the Western Ghats here provided a connecting trade route between the two regions. Bhagavati, a form of the goddess Durga, is one of the principal deities of Kerala, with numerous temples dedicated to her. The forests of South India have herds of elephants, and often captured and tamed elephants would be put to temple duty. Elephants are particularly integral to the culture of Kerala and are used mostly for temple ceremonies, rather than as working elephants in agriculture.